MarketSaw - 3D Movies, Gaming and Technology: Red Band, NSFW And Whatever Else You Want To Call It - New Featurette For PIRANHA 3DD!! 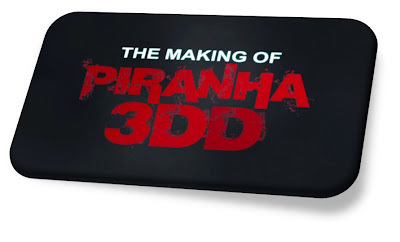 Red Band, NSFW And Whatever Else You Want To Call It - New Featurette For PIRANHA 3DD!! Yes, this is very much not safe for work. The latest bit of marketing for PIRANHA 3DD hits the spinning Internet via FunnyorDie and actually is quite funny! I mean with The Hoff and Gary Busey and all, how can you go wrong? The movie is blatant sexism though, so if you watch it, be prepared. It's audience knows who they are and they are marketing DIRECTLY at them with this featurette. Have a look if you dare! There is actually a spoiler in this thing, so again YOU HAVE BEEN WARNED! After the terror unleashed on Lake Victoria in PIRANHA 3D, the pre-historic school of blood thirsty piranhas are back. This time, no one is safe from the flesh eating fish as they sink their razor sharp teeth into the visitors of summer’s best attraction, The Big Wet Water Park. Christopher Lloyd (BACK TO THE FUTURE) reprises his role as the eccentric piranha expert with survivor Paul Scheer (THE LEAGUE) and a partially devoured Ving Rhames (PULP FICTION) back for more fish frenzy. David Hasselhoff trades in the sandy beaches of “Baywatch” to be a celebrity lifeguard at the racy water park. Prepare for double the terror, double the action and double the D’s in this sequel also starring Gary Busey (LETHAL WEAPON), Katrina Bowden (30 ROCK), Danielle Panabaker (THE CRAZIES), Matt Bush (ADVENTURELAND), Chris Zylka (THE AMAZING SPIDER-MAN) and David Koechner (ANCHORMAN: THE LEGEND OF RON BURGUNDY). PIRANHA 3DD opens June 1.